Desembarco del Granma National Park has been recognized for its marine terraces and pristine sea cliffs. Its terrestrial area has several karst features and rich endemic flora, while coral reefs can be found in the sea. The submarine terraces of Cabo Cruz and Maisí are like gigantic stepping stones. This national park lies in south-eastern Cuba. It was named after the yacht in which Fidel Castro, Che Guevara, Raúl Castro, and 79 of their supporters sailed from Mexico to Cuba in 1956 and incited the Cuban Revolution. This is quite remote site requiring careful planning, we started from Camaguey and then proceeded to Santiago de Cuba via road 20, which was extremely challenging for our old good Peugeot. In one place there was almost broken but still open for traffic bridge. In another place you have to pass unpaved road within several meters from the sea. But this road 20 goes directly through inscribed area and provides many outstanding views. All in all that involved about 600 km and about 14 hours of driving in one day. This part of Cuba is considered to the hottest place on the island. Combined with risen bottom of the sea it resulted in creation of unique natural terrace system and very rich and endemic biodiversity. While the place of Granma ship embarkation site in 1956 only provided formal name for the park and site, it seems to be included in the inscribed area as per official map. In Las Coloradas there is entry point for the site, where you have to pay for the park and El Guafe guided archeological path (we paid 15 CUCs for 2 people). The guide joined us in our car, as there is about 9 km from entry point to the path itself. 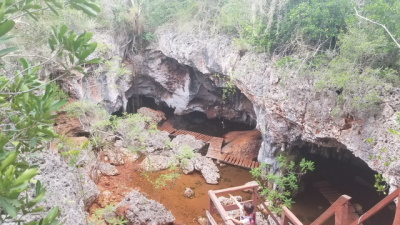 The hiking trail is about 2 km long, during the hike we climbed down to several carst caves and saw famous Idolo del Agua carved by indigenous Taino people (small and not impressive). Another highlight – huge old cactus tree. There is really significant number of various birds spotted during hike with the help of the guide, and there are also wooden information stands with the names of the birds. We also visited fishing village Cabo Cruz (further 3 km from El Guafe) with old lighthouse and cheapest fish restaurant in Cuba (and probably in the world), as the prices are quoted in CUPs (not in CUCs) there. It was 3 CUCs for 2 fish soups and 2 fresh grilled fishes. Excellent site for nature lovers with extraordinary fauna and flora with some pre-historic human traces and revolutionary heritage not to forget. Visited February 2018. To get to Decembarco del Grama National Park we took a taxi from Santiago de Cuba and followed the costal road which sometimes did not look like a road – seemed pretty dangerous but our driver made it! After 4 hours and a half and some stops on the way, we reached the village of Las Coloradas where the park visitors centre is located. There are many accommodation options in Las Coloradas, but you may also go and find a place to sleep in Cabo Cruz, fishermen’s village at the southern tip of Cuba. We stayed in Las Coloradas for two nights. The first, lazy day – some hours on the beach and a visit to the small museum of Decembarco del Grama… It is located in the NP so visit it you must pay the entry fee to the park – good news is that you pay once (10 CUC) and you can stay in the park or visit the park as many days as you wish. Then the long walk along the coast towards south – this part is already inscribed on the list. The second day we rented bicycles (just ask locals) to reach Cabo Cruz. It is around 13 km from where we stayed. First we stopped at the visitors centre to get some info about the park and its trails. An English-speaking lady who works as a ranger and a guide, showed us around and recommended what to do. Following her advice we started 8 km south with a trail called Sendero Arqueologico Natural el Guafe. The guide is compulsory and we had to pay few extra CUCs. But it is worth, ‘cos he pointed some most interesting features on the way: cavern with idolo del agua - Atabeira, the mother of all gods and waters, sculpted from stalagmite by pre-Columbian Indians, some other caverns (there are at least 15 cavers you can see) with pre-Columbian art and cult places, 500-yaer old cactus, some other important plants and different species of birds, hummingbirds included. Then we reached the village of Cabo Cruz. When you there you have few options what to do. Of course you can stay on the beach, but in this case you won’t see much. The best way to see the marine terraces is to hire a boat, but you should do it very early in the morning; when we arrived around noon we were told that at this time of the day the sea is too dangerous. The best way to see the cliffs is just to walk along the coast – it is an enjoyable walk for 2 hours one way, but you should be very careful, because it is very easy to hurt yourself on the sharp stones surface. But the views are amazing! After the long walk I decided to see the coast from above and follow a path which starts at the entrance to the village and leads to the top of the cliff (photo). And while in Cabo Cruz, it is good to try local fish in the only restaurant in the village. It is the cheapest fish you can have in Cuba. Perhaps the first thing for me to say about this site is how surprised I was that it is inscribed only for Natural Reasons. As its name suggests this is the place where Fidel Castro, Che Guevara and their fellow revolutionaries disembarked from the Granma to begin the campaign that would lead to the overthrow of the Batista regime and all that followed. This sounds like a cultural justification to me. Close to the entrance of the park is a small and rather empty museum commemmorating the landing in 1956 and a replica of the boat itself (on wheels!). Within the park I was able to enjoy a 2 hour guided walk, mostly thro' a kind of dry forest. I saw lots of birds, some archaeological bits and pieces and an example of the biggest cactus in Latin America. 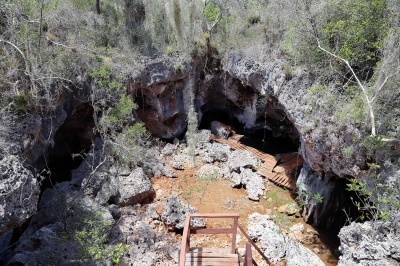 This is limestone karst country so there are also caverns to explore. We continued to Cabo Cruz at the furthest tip of the peninsula and from there were able to see the offshore reef which keeps the incredibly blue inshore water very calm. 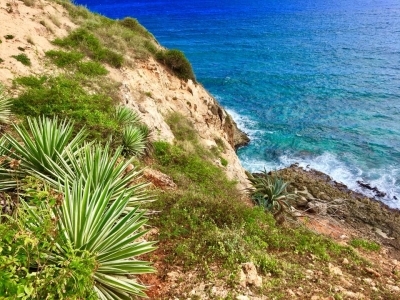 There are cliffs up to 100m high, white sand beaches, palm trees, gorgeous. I'd love to read another review from someone who has visited more recently to learn if things in the park have changed much since I was there. If anyone is thinking of going there the Hotel Niquero in the town of the same name near the northern entrance to the park was perfectly acceptable when I was there.